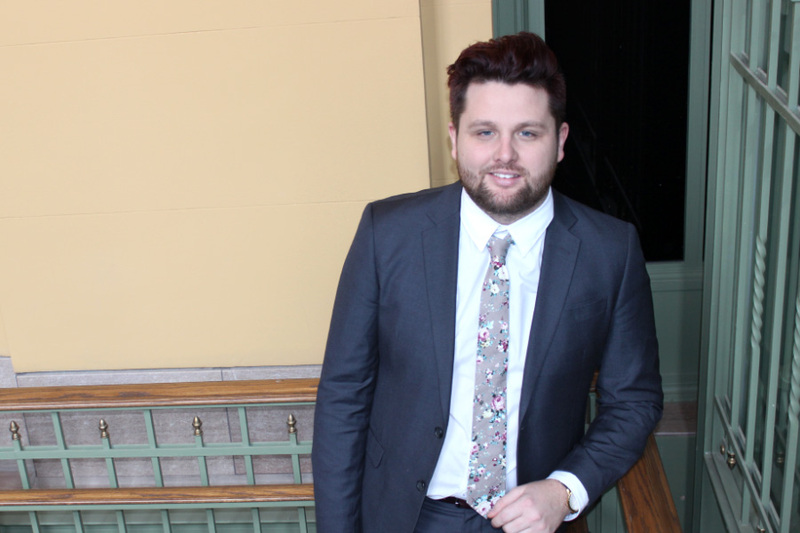 Studio Society members lead the community through their generosity and advocacy for public media. Donors who act on a deeper commitment to public media, understanding that extraordinary accomplishments require higher levels of contributions. Share the treasure of public media with future generations by remembering TPT in your will or estate plans. Foundations and corporations provide TPT critical support to sustain its impact and further its mission in Minnesota. Studio Society contributors ensure that Twin Cities PBS (TPT) continues to use the power of media to engage, inform and inspire. 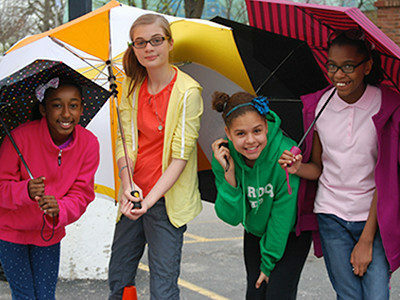 As our philanthropic partners, their support helps build stronger communities both within and beyond our region. TPT’s Studio Society recognizes annual contributions of $1,000 – $9,999 to help strengthen the impact of public media now and in the future. Learn more about how your philanthropy makes a material difference here. For more information about the Studio Society, please contact Mantha Petrovich, Development Manager at 651-229-1417 or [email protected]. Twin Cities Public Television, Inc. is a 501(c)(3) tax-exempt organization under section 501(c)(3) of the Internal Revenue Code. 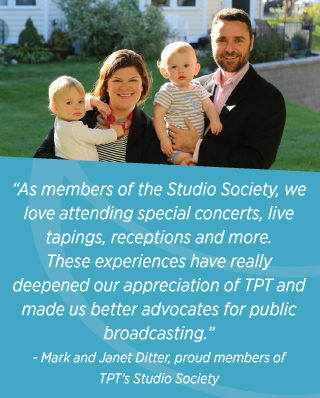 Invitations to private Studio Society events including: TPT’s Annual Recognition Luncheon with President & CEO, receptions with PBS talent, premiere screenings, behind-the-scenes evenings and station tours. Discounted tickets to station-wide events. Access to the DVD Lending Library. Advance notice of upcoming projects and programs. Recognition in TPT ’s Annual Donor Listing. There are a variety of ways to make a charitable gift, which may provide tax advantages for you. Please consult your adviser for your best giving option(s). Below are a few recommendations for consideration. Firm: UBS Financial Services Inc. 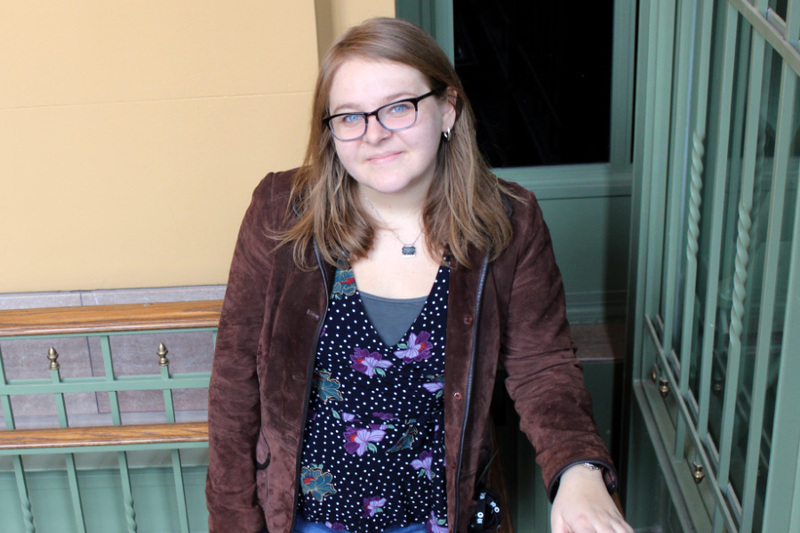 Please also contact Emily Blomquist, Development Assistant, at (651) 229-1548 or [email protected] with your name, type of stock and the number of shares so we can provide documentation for your tax deduction. At age 70 ½, IRA owners are required by law to take mandatory minimum distributions. An increasingly popular way to make gifts tax-free, transfers to TPT must be made directly from the IRA or by writing a check from the IRA up to a $100,000 limit. Now that the IRA Charitable Rollover legislation is passed permanently, this enables donors to plan each year in advance. Full Legal Name of TPT: Twin Cities Public Television, Inc.
To leave your retirement assets to TPT, you will need to complete a beneficiary designation form provided by your retirement plan custodian. If you designate TPT as beneficiary, we will benefit from the full value of your gift because your IRA assets will not be taxed at your death. Your estate will benefit from an estate tax charitable deduction for the gift. A gift of your life insurance is an excellent way to make a gift to TPT. If you have a life insurance policy that has outlasted its original purpose, consider making a gift of your insurance policy. Contact your insurance provider, request a beneficiary designation form and include TPT as the beneficiary of your policy. 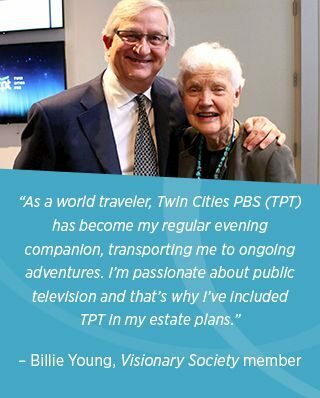 Including Twin Cities PBS in your will is an easy way to make a generous gift to TPT. In your will you have choices about how you name TPT as a beneficiary. You may wish to leave a fixed dollar amount to TPT. You will need to specify exactly how much you would like the station to receive. Another popular option is to give Twin Cities PBS a percentage of your estate. This makes good sense if you don’t have a clear idea of how much your estate will be worth at your death. Below is suggested language that you might use in your will to designate Twin Cities PBS as a beneficiary. I give devise to Twin Cities Public Television, Inc., a not-for-profit corporation of the State of Minnesota, ____percent of my estate (or the residue or the sum of $_____; or the properties, securities, etc. described herein) to be used for its unrestricted purposes, or for its endowment. It is very easy to add a codicil to your will, which designates TPT as one of your beneficiaries. Please let us know if you have included TPT in your plans. Through Donor-Advised Funds, you make irrevocable contributions to a fund you establish, often in your name or to honor a family member. The most typical charitable sponsors are community foundations and funds affiliated with financial service firms. You then claim a charitable deduction for income tax purposes and recommend that money be granted to TPT. These organizations work closely with us to fulfill your charitable goals. Please allow 2-3 months for your recommendation to be fulfilled by calendar year end. Another option to match your philanthropic intent with TPT’s public media mission is to make a grant from your family foundation. A private family foundation by law must distribute a minimum of 5% of its assets yearly to charity. TPT often benefits from family foundations who give grants for general operations or to fund a specific content area or program. TPT works closely with family members and/or foundation appointed administrators to jointly fulfill the mission of donors and TPT. The Charitable Gift Annuity (CGA) is one of the oldest and most popular ways to support a favorite charity. It is simple to complete and provides income for you or another individual of your choice as well as tax benefits. In exchange for your gift of cash or marketable securities, TPT agrees to pay you (and/or a loved one) an annual sum for the remainder of your life(lives). The amount of the annuity is based on the age of the income beneficiary(ies): the older you are, the higher the rate you will receive. A CGA is a simple contract between a donor and a charity, such as Twin Cities PBS. The contract specifies the amount of income to be paid annually (the “annuity”) to the donor; the name of the individual (or individuals) who will receive the income; and the charitable purpose of the gift after the life of the income recipient(s). CGAs can be established with a gift of $10,000 or more and qualify you for an immediate income tax deduction. And, a portion of the yearly income is tax-free. You may also receive favorable capital gains tax treatment when making gifts of appreciated property. A Charitable Remainder Annuity Trust (Annuity Trust) is a gift plan defined by federal tax law that allows you to provide income to yourself or others while making a generous gift to Twin Cities PBS. The income may continue for the lifetimes of the beneficiaries you name, a fixed term of not more than 20 years, or a combination of the two. A Non-Grantor Charitable Lead Annuity Trust (Lead Annuity Trust) is a gift plan defined by federal tax law that allows you to transfer assets to family members at reduced tax cost while making a generous gift to Twin Cities PBS. If you would like to speak to someone about the Studio Society, please call Mantha Petrovich at 651.229.1417 or use the form below. President’s Society members believe deeply in the power of public media to transform our society. 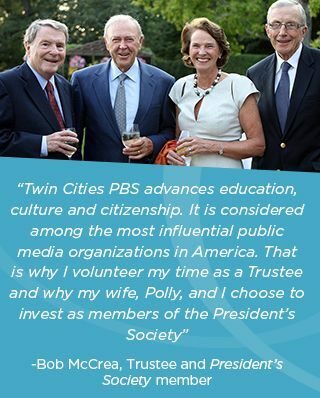 President’s Society donors give generously to Twin Cities PBS (TPT) and together, we impact society through the power of media. Donors believe that extraordinary accomplishments require greater contributions and often express philanthropic intent through individual retirement account (IRA) distributions, donor advised funds, trusts, and family foundations. With leadership gifts of $10,000 – $100,000, President’s Society contributors provide essential investments that allow TPT to develop, deliver and sustain high-quality programs, and supply resources for future innovation. Donations are applied where it is needed most or may be directed to a TPT content or program area. Learn more about how your philanthropy inspires impact here. 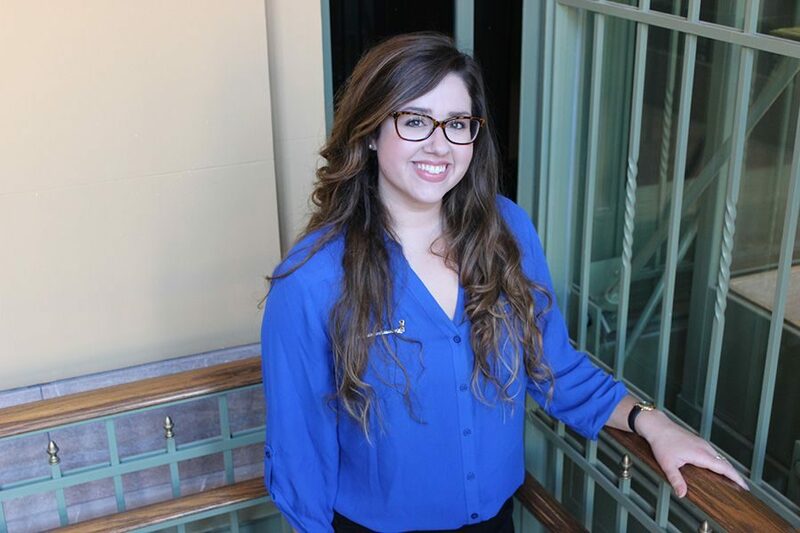 For more information about the President’s Society, please contact Caitlin Zintl, Director of Development at 651-229-1403 or [email protected]. The ability to direct giving to a personal passion or station initiative. Invitations to exclusive local and national events with PBS luminaries. A select Almanac evening or Program screening reserved for you and your guests. Special on-air and in-print recognition. Private dinner or lunch and station update with the President and CEO. The deep satisfaction in knowing that President’s Society philanthropy transforms the station and makes a material difference in the communities we serve. 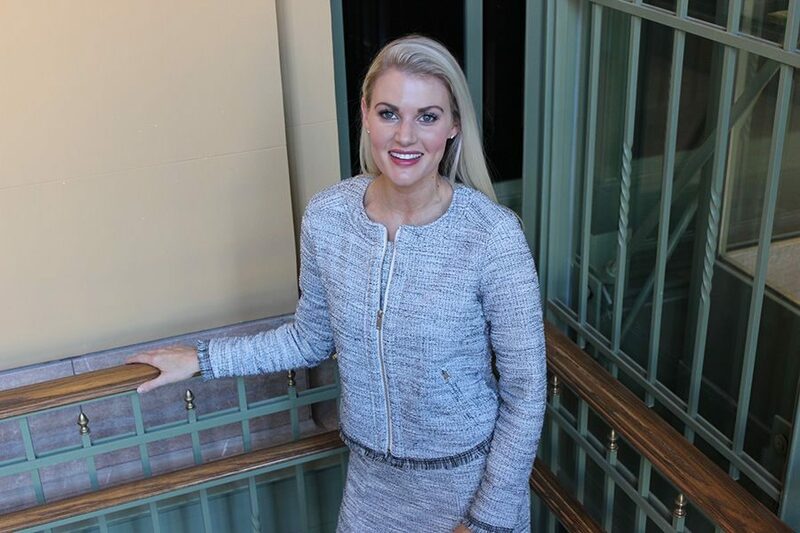 If you would like to speak to someone about the President’s Society, please call Caitlin Zintl, Director of Development at 651.229.1403 or use the form below. Visionary Society members help to secure TPT’s future, by including TPT in their will or estate plan. Visionary Society contributors ensure that Twin Cities PBS (TPT) will be available for our children, our grandchildren and for generations to come. Leaving a legacy can be as simple as amending your will or changing the beneficiary of your IRA or retirement plan and you can put TPT as a beneficiary on your life insurance policy. Your gift of any size, unless otherwise directed by you, will be designated for the station’s General Endowment Fund, where it will provide support for TPT in years to come. 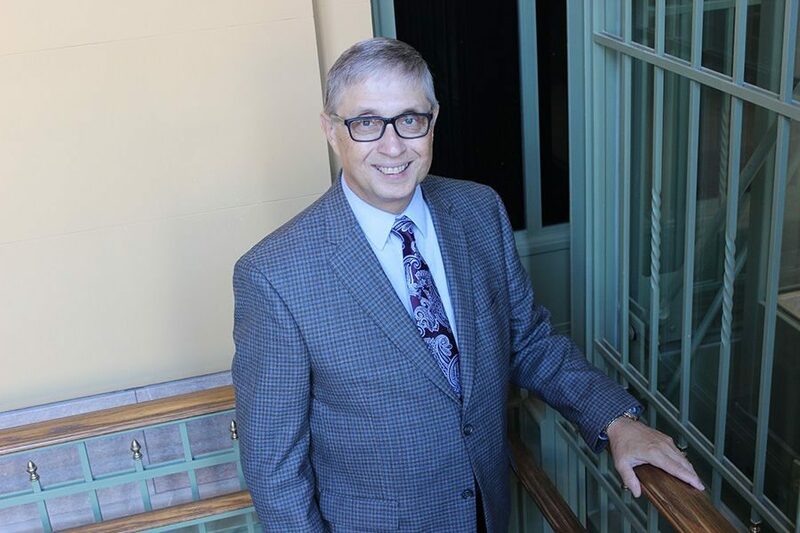 For more information about the Visionary Society, please contact Bradley Reiners, JD, Sr. 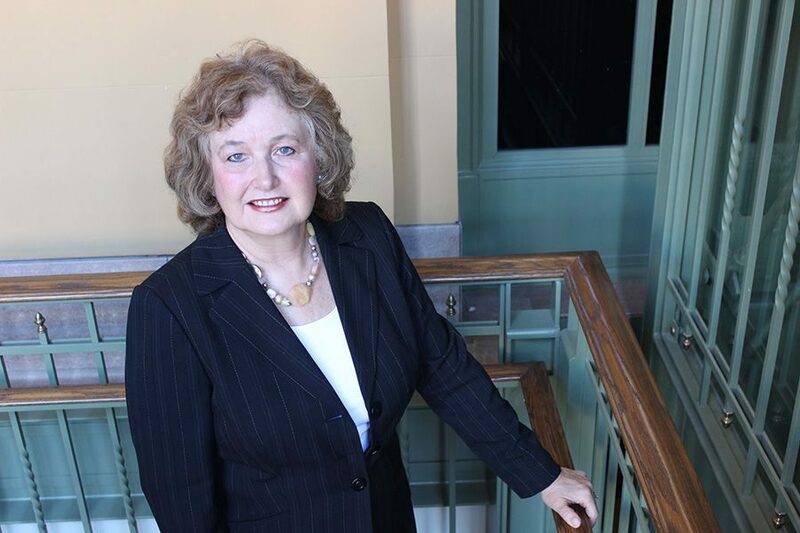 Manager of Gift Planning at 651-229-1491 or [email protected]. Please let us know if you have included TPT in your plans. Learn more about the Visionary Society here. Invitations to private events including: TPT’s Annual Recognition Luncheon with President & CEO, receptions with PBS talent, premiere screenings, behind-the-scenes evenings and station tours. Recognition in TPT’s donor listing. There are a variety of ways to include TPT in your estate plans. Please consult your adviser for your best giving option(s). Below are a few recommendations for consideration. Including Twin Cities PBS in your will is an easy way to make a generous gift to TPT. In your will you have choices about how you name TPT as a beneficiary. You may wish to leave a fixed dollar amount or you might want to give TPT a percentage of your estate in your will or trust. I give and devise to Twin Cities Public Television, Inc., a not-for-profit corporation of the State of Minnesota, _____ percent of my estate (or the residue or the sum of money $______; or the properties, securities, etc. described herein) to be used for its unrestricted purposes, or for its endowment. Gifts from a retirement account such as a IRA/Roth IRA or other qualified retirement plan assets, such as 401(k), 403 (b), or Keogh plan. To leave your retirement assets to TPT, you will need to complete a beneficiary designation form provided by your retirement plan custodian. If you designate TPT as beneficiary, we will benefit from the full value of your gift because your IRA assets will not be taxed at your death. Your estate will benefit from an estate tax charitable deduction for the gift. A Charitable Gift Annuity (CGA) is a win-win giving option for many donors. It is a simple contract between you and TPT where, in exchange for your gift of cash or stock, TPT will pay you annual annuity for life. When payments end upon your death, any amount remaining in the contract is used to support TPT. Please contact us for more information and a personalized illustration. If you would like to speak to someone about the Visionary Society, please call Brad Reiners at 651.229.1491 or use the form below. Essential working capital – ensuring that TPT has the organizational capacity to create and deliver high-impact programs and projects on a sustained basis. Funding for local and statewide initiatives that leverage the power of media to help young people succeed, inform and engage Minnesotans, expand access to the arts, and build stronger communities. Support for award-winning local and national documentaries that drive awareness and understanding about untold stories in Minnesota’s and America’s history, the impact of major health issues, the experiences of veterans, and more. Funding for major national initiatives that help people age vitally, advance gender-equitable teaching and learning in science, technology, engineering and math (STEM), and more. Read the 2015 Local Content and Service Report and see how TPT has impacted the Twin Cities community through the power of media. If you would like to speak to someone about Foundations, please call Amie Miller at 651.229.1237 or use the form below.